Say hello to Intel's newest executive. PC Perspective founder and EIC Ryan Shrout announced today his departure from both PC Perspective and his consulting company, Shrout Research, to join Intel as the company's chief performance strategist. On his transition, Shrout looks back fondly at the 19 years he spent leading PC Perspective. "This move represents a new challenge and the chance to influence the direction of a major player in the technology field from within," he explained. "The opportunity to work at a company with the legacy of Intel and be trusted with the scope of this role is humbling. It’s not often that this is presented, and after 19 years, I found the opportunity seemed like the right one, at the right time." Shrout also notes that the move will allow him more time with his daughter—a little more work/life balance. There's no word yet on what he might be doing for Intel. Shrout explains in a Twitter thread that he will be able to share more information regarding his new position in "a week or two," so we'll just have to wait to officially hear what his new responsibilities entail. His hire comes on the heals of reports about Intel ending work on its 10nm process, reports that Intel has denied. For loyal PC Perspective readers, this news may or may not have come as a surprise. As Shrout notes in his farewell letter, the growing commitments to his consulting company left little time to write for PC Perspective, and Ken Addison took over as primary reviewer. Addison has also been one of several team members who have been managing content for a prolonged period of time. As for Shrout's future home at Intel, Gregory M. Bryant, senior VP & GM of Intel's Client Computing Group, said he is looking forward to working with him. 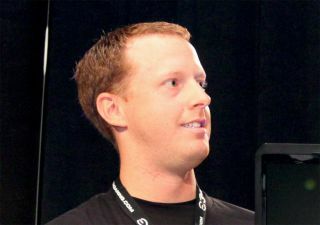 Shrout officially founded his website in 2004 as PC Perspective, but existed previously under Amdmb.com and Athlonmb.com since 1999. He founded Shrout Research to provide a range of consulting services to companies in the tech industry. Both ventures presented him the opportunity to work with some of the top tech companies in the world, including AMD, Nvidia, Dell, Asus, Oculus, Microsoft and, of course, Intel.